Published: 15th March 2013M / 3 Jamadilawal 1434H, Fr. ... I went on to try create the letter Dad in Blender. Dad is the 15-th letter of the Arabic alphabet and the 16-th letter of the Jawi alphabet. The early result looked like a letter made of modelling clay, see Pic 1. Pic 1 - Blender. The early result. 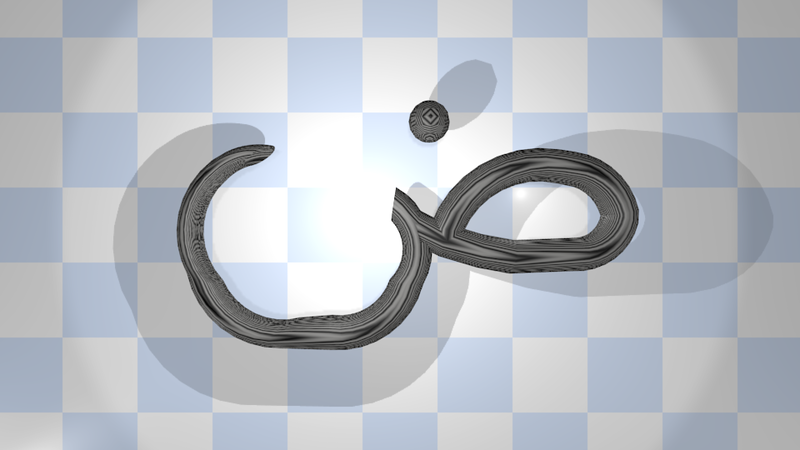 To create a better-looking letter, I thought of importing a file then tracing the letter but some how couldn't import the SVG file into Blender and didn't know why. ... 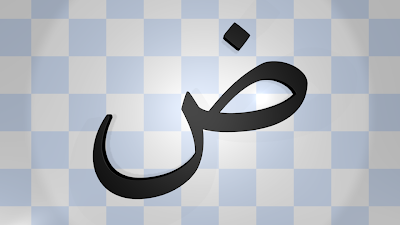 I realized that my mistake was I tried to import text instead of path. The text has to be converted to a path first, and then can it be imported into Blender. 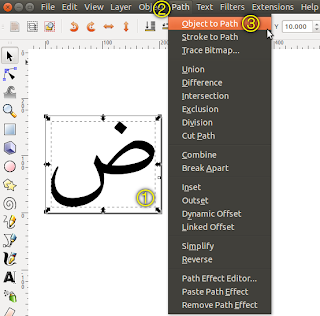 Referring to Pic 2, in Inkscape, select the object (text) then go to Path > Object to Path. Using the Edit path by nodes cursor (see Pic 3), click the now-path object. The outline of the now-path object should have nodes like that in Pic 4 . Pic 2 - Inkscape. Converting object to path. Pic 3 - Inkscape. The Edit path by nodes cursor. 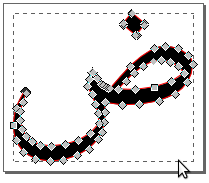 Pic 4 - Inkscape. Nodes, after converting object to path. Shown in Pic 5 is the imported SVG Dad after some rotating, scaling and texturing. Shown in Pic 6 and Pic 7 are the final results of Pic 5. - Pic 7 has a thinner extrusion and brighter lighting. Pic 5 - Blender. The flat SVG Dad. Pic 6 - Blender. The final result 1. Pic 7 - Blender. The final result 2.